Perthshire will once again be showcasing some of the very best visitor attractions from across the region at VisitScotland Expo 2017. 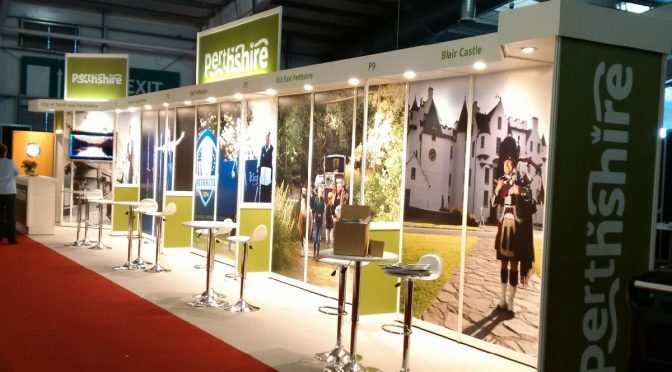 2017 is the Year of History, Heritage and Archaeology and the attractions featuring on the City of Perth and Perthshire stand (N15-N28) all represent what it is the ‘year of’ hopes to celebrate – our people, traditions, culture, landscapes, attractions, icons and hidden gems. On the stand this year are Scone Palace, the crowing place of the kings of Scotland; the Black Watch Castle and Museum where the heritage of this elite military regiment is brought to life; Scotland’s oldest free public lending library, the Library of Innerpeffray; the Famous Grouse Experience at Glenturret Distillery, Scotland’s oldest distillery; Blair Castle; Golf Perthshire and Pitlochry Festival Theatre. There is a wealth of activities visitors to Perthshire, whether they are visiting on their own or as part of a larger group. Perthshire is an area with an important place in Scotland’s history and home to Scotland’s “newest” city with official city status restored to Perth in 2012. Scone Palace, Blair Castle, the Library of Innerpeffray, the Black Watch Castle and Museum, and the Famous Grouse Experience have all played an important role in the history and heritage of the area. Pitlochry Festival Theatre has its own unique story and occupies a major place in Scotland’s cultural tourism landscape. The Perthshire area is currently undergoing a cultural resurgence with the opening of new attractions such as the Pitlochry Dam Visitor Centre, the establishment of Culture Perth and Kinross as a new arts and culture organisation, the refurbishment of Perth Theatre and Perth Museum & Art Gallery, and the regeneration of Perth City Hall and St Pauls Church to turn them into cultural and public use attractions.